I have a question for you today: “Why Change?” In my work as an executive coach and corporate trainer, I try to get people to change every day. 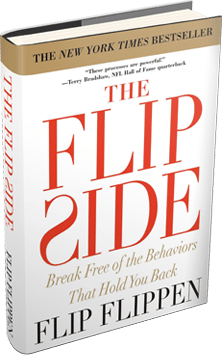 Ironically, eighteen years ago when I first sat down with Flip Flippen about my personality and my personal constraints, I wasn’t just a little bit defensive, I was a LOT defensive. I felt threatened, and I was very skeptical of being labeled. Why would I listen to this? I wasn’t in a crisis, in fact I was doing pretty well—I had a history of academic success, was in the middle of a Ph.D. program, had good integrity, was successful at sports, etc. I felt like I was already a high performer. So, why change? Why grow? The reason….INFLUENCE. We can all increase our influence by growing—by better understanding who we are, how we relate to the vast universe of differing personalities, and how we can better navigate those waters. For those of us who are overly nurturing, by being more direct and by stretching people appropriately, you can increase your influence. For those of us who are sometimes too candid, by not putting people on the defense and by better perfecting delivery of information, you can gain influence with people who might normally either tune you out or take offense (or both!). What is influence really worth? As a leader, it’s priceless. And it is worth growing for!